When working with pork it is essential that the meat is handled and stored properly to ensure safety. You cannot see the harmful bacteria on the meat so you must handle it as if it is present. Trichinella spiralis (trichina) is a parasite that is found on pork, which can cause a food borne disease call trichinosis. 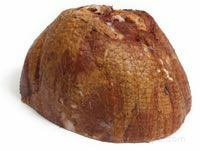 Hams are processed according to USDA guidelines, which are set up to eliminate the presence of trichina. Follow the guidelines below to ensure safety against contamination when handling ham. Cleanliness: A clean working environment is essential in the prevention of contamination in working with ham and other meats. 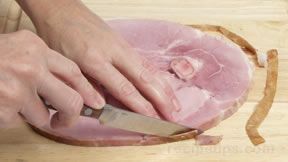 Be sure to wash hands thoroughly before and after handling uncooked ham. The work area, cutting boards, and utensils must be thoroughly cleaned with hot soapy water after being exposed to raw meat and should not be used for other foods until properly cleaned. This will prevent cross contamination of bacteria between foods. 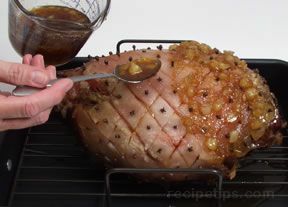 When working with other foods at the same time as preparing and cooking ham, use different utensils for each food. Do not use the same cutting board for cooked meat as was used for the raw meat, unless it has been properly washed and dried before using. Handling: When purchasing ham check the label carefully to see if it requires refrigeration. If it requires refrigeration, you should purchase it at the end of shopping so that it is exposed to unsafe temperatures as short a time as possible. Inspect it for any leakage and if there are signs of leaking, the ham should be placed in a plastic bag to prevent any leakage from contaminating any other foods. After purchasing it should be taken home and refrigerated as soon as possible. When cooking and serving ham, the meat must be handle properly to prevent contamination. Use a different platter and cooking utensils for cooked meat than what was used for the raw meat, unless they have been properly cleaned and dried after exposure to the uncooked ham. Be sure that uncooked ham does not come in contact with foods that have already been cook or foods that do not require cooking before being consuming, such as raw vegetables and fruit. 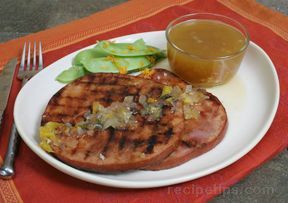 It is important not to overcook ham if the desired result is to produce meat that is tender and juicy. In the past it was thought that pork had to be cooked until well done to eliminate the risk of trichinosis. Trichinosis is a food borne illness, which is caused by exposure to trichinella spiralis (trichina), an organism sometimes found in hogs. Improved production conditions and USDA guidelines have mostly eliminated the risk of trichinosis but some risk does remain. We still have to be concerned that the meat is handled and cooked properly to eliminate all risks. Trichinosis is killed when the meat reaches a temperature of 137°F. 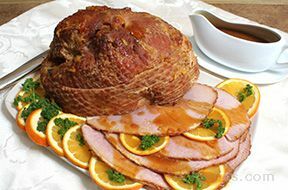 To ensure that the ham will be safe from trichinosis, it is recommended that uncooked hams be cooked to approximately 160°F, which is medium done and should leave the meat juicy and flavorful. Most often dry-cured hams will have mold on their exterior surface, which develops during the long curing process. 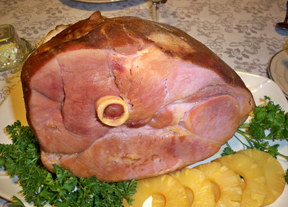 The mold is generally harmless and is washed off before preparing the ham. During the dry curing process, moisture is drawn out of the ham, leaving them containing little water. Because of the low water content of dry-cured hams, bacteria cannot grow in them. This is why dry-cured hams, which are uncooked, can be stored at room temperature. Staphylococcus aureus (staph) is a bacterium that is destroyed through cooking and processing. If the ham is mishandled, the staph bacteria can reappear. 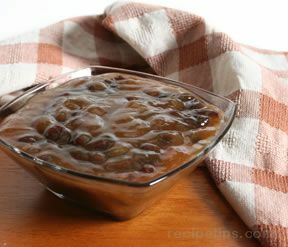 Staph can produce a toxin that cannot be killed by additional cooking. The high salt content that is present on a dry-cured ham's exterior hinders the growth of the staph bacteria. 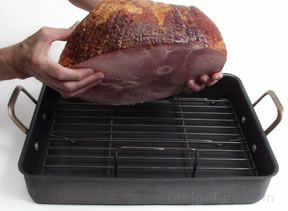 Once the ham is sliced, the moister interior allows the bacteria to grow. This is why once a dry-cured ham is sliced it must be refrigerated. Curing solutions, used on wet-cured hams, contain salt, sodium nitrate, nitrites, and may also contain sugars, seasonings, phosphates and ascorbates. 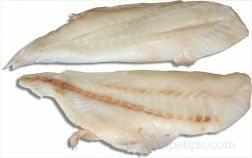 The curing solution provides preservation, color development, and enhances flavor. 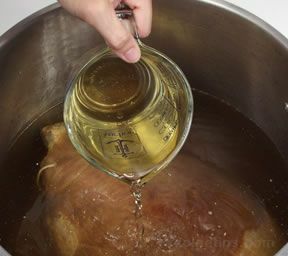 The salt, sodium nitrate, and sodium nitrites in the curing solution inhibit the growth of Clostridium botulinum, which is a deadly microorganism that causes botulism. 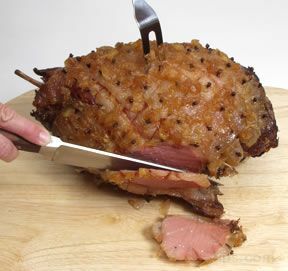 When cooking ham, it is suggested to remove the meat from the heat source when it reaches a temperature that is 5°F lower than the desired doneness temperature and then allow the meat to rest for 10 to 15 minutes before serving or carving. In this time the meat continues to cook and will reach the proper temperature without the meat becoming overcooked. See the chart below for internal temperatures that should be reached for proper doneness. Most hams should be stored so that they are kept out of the temperature zone in which bacteria grows quickly. The danger temperature zone is a range between 40°F and 140°F. Fresh ham and cured ham can be stored in a refrigerator for several days, depending on the type of ham. 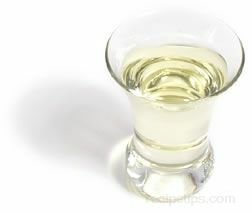 If it is not going to be used within the recommended time, it should be frozen to prevent it from perishing. 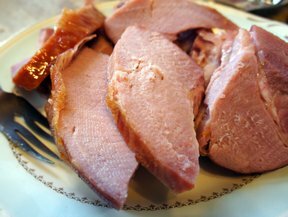 Leftover ham should be wrapped tightly and refrigerated as soon as possible. 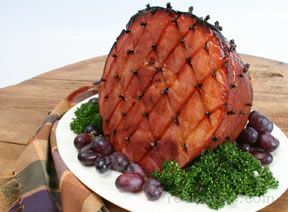 Do not leave the ham at room temperature for more than two hours. If it is not going to be used within four days of cooking, it should be frozen. Uncooked or cooked ham can be stored safely in a refrigerator at 40°F or lower for several days. The amount of time that it can be refrigerated will depend on the type of ham, how fresh it was when purchased, the temperatures it is exposed to in transporting from the store to home refrigeration and the type of packaging used. 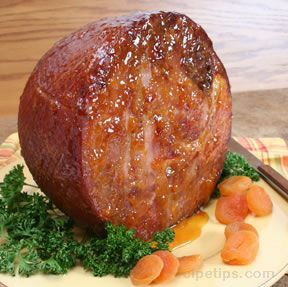 Ham should be stored tightly wrapped to prevent the meat from drying out due to exposure to air. Whenever possible, leave the ham wrapped in its original package to minimize handling of the meat. If the original package is open, rewrap tightly in plastic wrap, foil, a leak proof bag, or place in an airtight container. The meat should be stored in the coldest section of the refrigerator. Storage times for different types of ham are shown below in the Storage Chart. 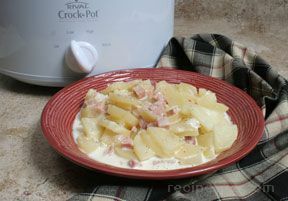 Leftover cooked ham should be refrigerated as soon as possible after serving. 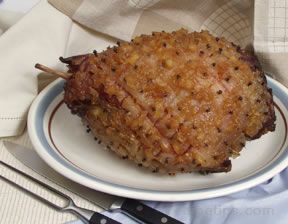 Do not allow the ham to set at room temperature for more than two hours. 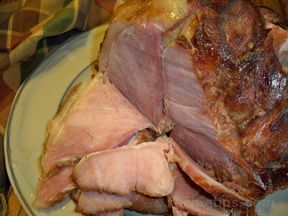 Leftover ham does not need to be completely cooled before refrigerating. Wrap tightly in plastic wrap, foil, an airtight bag or airtight container and then store in a refrigerator at 40°F or less. See Storage Chart below for storage time of leftovers. 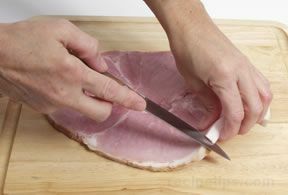 Do not slice the ham until just before serving. Slices will lose moisture and dry out faster than uncut pieces. If you are not sure whether the ham has been refrigerated for the maximum suggested storage time and you are questioning if it is safe to eat, do not taste test it . . . be safe and THROW IT OUT! 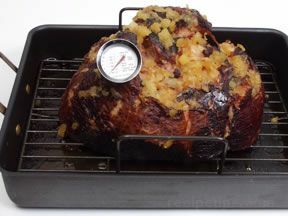 Ham should be stored in the refrigerator at 40°F or lower and if it is not going to be used within the suggested storage time, it should be frozen to prevent it from perishing. 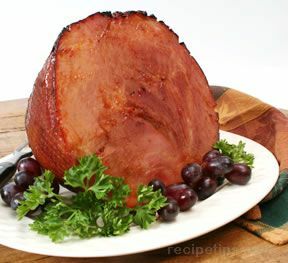 Freezing should be avoided if possible because it will affect the flavor and texture of the ham. Freezing meat has little affect on its nutritional value. 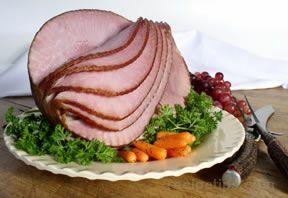 When freezing, the ham should be frozen while it is as fresh as possible to maintain the best quality. If it is going to be frozen before it is cooked, it should be left in its original packaging. If its removed from its original package or the original package has a hole in it, the ham should be rewrap tightly, using moisture proof heavyweight plastic wrap or foil, freezer bags or freezer paper. To maintain maximum quality, double wrap the ham and be sure to wrap it tightly against the entire surface of the meat to help keep in moisture. Mark the wrapped package with contents and the date so you can be certain of how long it has been stored in the freezer. 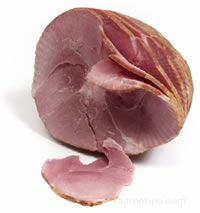 The ham can be kept frozen longer than the recommended times and still be safe to eat but the quality of the meat will begin to deteriorate. The ham should be frozen as quickly as possible. The quicker it freezes the better it will be when thawed. To speed up the freezing process, place the package on the floor or against the wall of the freezer since they are the coldest parts. It is always best to freeze and store frozen food in a freezer unit, rather than a refrigerator freezer. The freezer units will maintain a temperature of 0°F or below, which will allow food to be stored for longer periods of time. A refrigerator freezer will generally only maintain a temperature of 10°F to 25°F and is opened more often, adding to the fluctuating temperature. If the ham is stored in a refrigerator freezer, it should be used sooner than if stored in a freezer unit. Freezing times for maximum quality are shown below in the Storage Chart. Use moisture proof wrap or bags when freezing ham. Wax paper is not moisture proof and should not be used for wrapping ham because it would not hold the moisture in the meat. Freeze ham as soon as possible to maintain the best quality. Do not freeze canned ham. If the canned ham is not a shelf stable item, remove the meat from the can, wrap tightly, and then freeze. 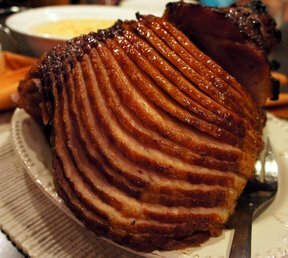 If the ham has a bone that could poke through the wrapping, protect it with foil or plastic wrap before wrapping the entire piece.